Leeds United Could Eye This Bristol City Ace Instead Of Missed Target: What Should Be Bielsa’s Play? Leeds United have been dealt a body blow in their chase for Swansea City winger Daniel James as the Welshman is negotiating a new contract with his current outfit. The 21-year-old was close to joining the West Yorkshire outfit in the summer, but the move fell through under spectacular circumstances. Latest reports from Bristol Post now indicates that Marcelo Bielsa might look to revisit a transfer for Bristol City winger Callum O’Dowda in the summer as James seems to be out of bounds at the moment. The winger was in the final few months of his contract in January, and he could have left the club in the summer for free. The Robins had an option of triggering a year-long extension which they did in January. Therefore the Irish winger is now contracted to stay with Bristol City until 2020. Reports in January came out that Bielsa might look to sign him if they fail to land James, but they ended up with neither winger. The same reports added that O’Dowda could cost somewhere in between £8-10m. £10m was the figure which the Whites were willing to pay for Daniel James in January. United’s CEO indicated that they would maintain an interest in the 21-year-old. However, recently Graham Potter went on to claim that James is now worth double and maybe even triple of what Leeds United offered for him in January. Therefore, O’Dowda can be a cheaper option to consider and the 15 times Ireland international could be targetted by the Wites. Bristol City are looking to get the winger to sign an extension, but his future is still uncertain at the club. Moreover, O’Dowda’s form has dipped in the past few games as the Robins are now without a win in their last five matches. Despite all this, he could be a decent addition to Leeds United’s lineup in the summer given the fact that the Whites don’t have too much depth in the wide areas. Now we can’t say whether he will play first-team football or not by next season as if the Whites move up to the Premier League; then they will be better off signing a more proven player. 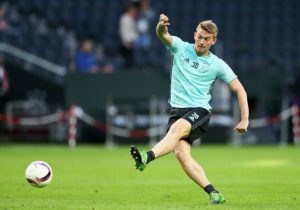 The Irish winger could still be signed given his ability and work rate, but he will be kept more as a backup option in the Premier League. Whereas at the Championship level, O’Dowda is a decent bet to start. In any case, United should look to sign this winger in the summer. The 23-year-old could be tempted into making a move if Bielsa and his men secure a place in the English top flight. Rangers Main Man On Shortlist For Top Job: Should Fans Worry That Gerrard Can Pull Off A Rodgers? Arsenal Reignite Interest For This Atletico Madrid Winger: Should The Gunners Make A Move For Him? Leeds United Enter The Fray To Sign This Impressive Fullback From Bristol City: Massive Coup For Bielsa? Middlesbrough Wrap Up Deal For This Defensive Beast: Why This Is A Good Move By Pulis! Derby County Set To Move For Exciting Chelsea Player: Is He Key To The Rams’ Championship Survival?